A holiday to Dubai is an event for everyone, and there are numerous attractions that are specifically aimed at younger travellers including theme parks, shopping malls and safaris. But for the young at heart, there are plenty of establishments like restaurants, bars and nightclubs that are great for relaxing in after a day spent touring the city. People by Crystal is located at the top of Raffles pyramid in Dubai on the 18th floor. It is the believed to be the only nightclub in the world’s that’s located inside a glass pyramid with panoramic views from all sides. It was created by the Crystal Group in 2010 and voted best club in Dubai by Time Out for two years in a row. It is aimed at the younger market and hosts flashing lights shows, falling confetti and an excellent line-up of music and DJs. One of the most popular nightclubs in Dubai is the Cavalli Club, the brainchild of Italian fashion designer Roberto Cavalli. Launched as his latest lifestyle concept, the venue boasts a capacity of up to 1,500 people. The interior, it is claimed, cost in the region of $30 million and the Swarovski crystals are a visual reflection of this cost. The club has three suspended lounge bars at The Fairmont hotel, and although very ostentatious, it has been bringing in the youth of Dubai since it opened. Look out for the prominent RC insignia, Robert Cavalli’s trademark, which is everywhere. Trilogy nightclub offers a very spacious environment with two dance floors divided into three floors. The interior is a combination of traditional and modern architecture with an Arabic theme and music is varied along the lines of reggae and hip-hop to lounge and soul. Note that the Trilogy Rooftop is closed during the summer months. Boudoir nightclub, in the marine district of Dubai, has a Parisian ambiance which makes it very popular with the expatriate community. The venue attracts a very glamorous crowd but tends to veer towards smartly dressed couples. Cirque Du Soir Dubai took over the space occupied by Club 400 in the Fairmont Hotel Dubai. This is a playful and adventurous nightclub that boasts a big-top dance space arranged in a main dance floor. 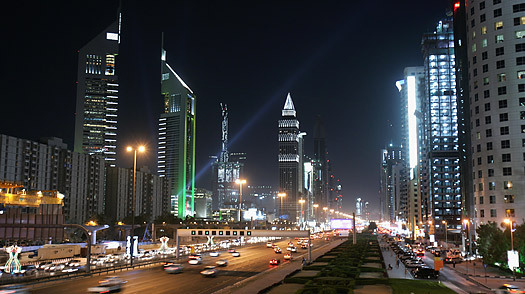 This is an alternative venue to the mainstream nightclubs in Dubai and is very popular with young partygoers.